This article is about a character from Mobile Golf. For an item from the Mario & Luigi series, see Bean. For the queen of the Beanbean Kingdom, see Queen Bean. 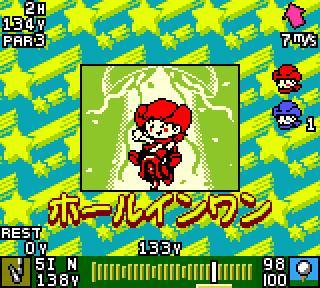 Bean is a rowdy, childish golfer in Mobile Golf for the Game Boy Color. He is the champion of the first tournament that the player must defeat in singles. Along with Rozary, Powert and Bird, Bean is one of the four human golfers that the player must face in four singles tournaments, similar to the fashion of Mario Golf for the Game Boy Color. According to Bean's profile on Camelot's Japanese Mobile Golf website, he is a mischievous little boy who was raised on a ranch. In addition to doing his daily deeds as a cowboy, he practices golf as well. It is unclear whether or not Bean is younger than Kid, who became a legendary golfer at the age of 10. His Mario Golf counterpart would be Putts. His name "Bean" refers to his size and stature as a young boy. The horse he is seen with in artwork does not appear in the actual game. This page was last edited on December 27, 2018, at 16:54.